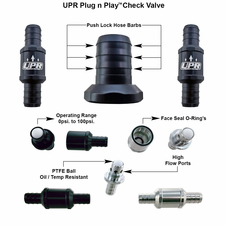 UPR designed this check valve specifically to deal with all the pitfalls of all Supercharged, Turbocharged, and Ecoboost PCV system and its many shortcomings that allow a substantial amount of oil to be sucked into the combustion chamber during normal operation. Moving up to a better-flowing check valve with proper flow and ZERO cracking pressure. This has been one of the best Boosted application PCV system updates we have developed to be just a simple Plug n Play™ installation and leaves nothing to chance. Installs in 5 minutes. No one else can stack up to the bold clean styling of our aftermarket Billet dress ups, Street Strip & Racing Suspension & Performance Parts for your late model American Muscle Car! 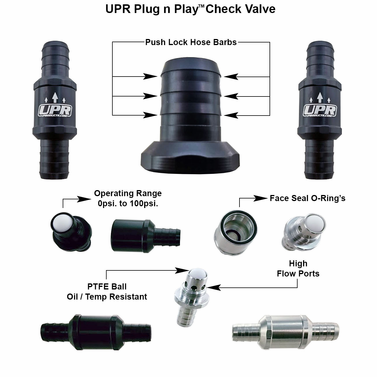 UPR designed this check valve specifically to deal with all the pitfalls of all Supercharged, Turbocharged, and Ecoboost PCV system and its many shortcomings that allow a substantial amount of oil to be sucked into the combustion chamber during normal operation. Moving up to a better-flowing check valve with proper flow and ZERO cracking pressure. This has been one of the best Boosted application PCV system updates we have developed to be just a simple Plug n Play™ installation and leaves nothing to chance.